Keratosis obturans is an accumulation of obstructing desquamated keratin plugs in the external ear canal. Although the origin of this condition remains uncertain, it is thought to be due to chronic hyperemia of the external meatus. Another external ear condition frequently described is external ear canal cholesteatoma (EACC). The squamous tissue at a specific site causing bone erosion in the external auditory canal. The indicative clinical manifestations of keratosis obturans are severe otalgia and conductive deafness secondary to the intensification of desquamated material in the external ear. We present a case of keratosis obturans that the disease presentation was largely silent but has caused severe destruction of the EAC exposing the vertical segment of the facial nerve. A 20-year-old female presented to our clinic with the complaints of pain, reduced hearing, and blocking sensation over her right ear for 3 weeks duration. A detailed history taken revealed that she had similar complaints about 4 years back, for which she was administered ear drop and no further treatment since then until her recent visit to the ORL clinic about 2 weeks before the last visit. She had impacted keratinous debris over her right ear canal which was toileted, and the tissues sent for histopathology examination. Clinical examination on the last visit revealed a normal looking ear with an apparent automastoidectomy cavity on the right containing whitish keratinous debris [Figure 1]. 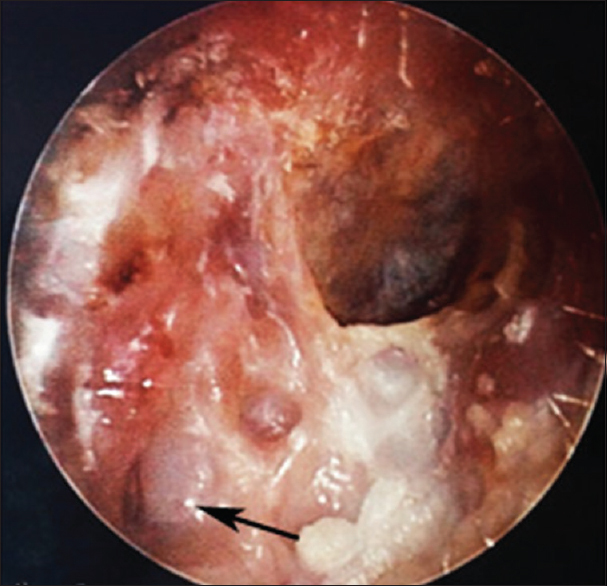 The tympanic membrane was observed intact while the facial nerve was partially visible in the posterior ear canal wall after aural toileting [Figure 2]. Nevertheless, there was no facial nerve palsy, and the left ear was normal. A pure -tone audiogram showed normal hearing in the left ear and mild high-frequency sensorineural hearing loss at 6 kHz and 8 kHz in the right ear ranging from 30 to 40 dB. The specimen sent for histopathological examination microscopically showed fragments of tightly packed keratin squames in lamellar pattern. This was consistent with keratosis obturans. Most literatures compare keratosis obturans and EACC as both occur in the external ear canal and they have some similar characteristics. However, there are differences in clinical basis. Undiagnosed wax keratosis may lie passively for a long period without revealing any symptoms apart from slight deafness, even it might be not apparent. During this period, the surrounding envelope merely becomes thickened by further desquamation of the epithelium. This process may progress to a stage where the wax keratosis becomes firm that it erodes by pressure alone, first, the epithelium of the deep external auditory canal, and then the bony canal, giving rise to a true keratosis obturans. A period of many years may elapse before it is detected, commonly in an adult patient. Piepergerdes et al. reported that the bilateral occurrence of keratosis obturans more frequently in children. Generally, the most common presenting symptom is otalgia which is mostly acute and severe. The pain ranges from a constant throbbing ache to such excruciating pain that the sufferer sometimes could not even sleep the entire night. There is also accompanying conductive hearing loss due to mechanical obstruction of the external ear. There has been report of a case of automastoidectomy caused by neglected keratosis obturans. In that case, the bone resorption occurred just posterior to the bony annulus and extended back into the mastoid, but no soft-tissue structures were reported to be exposed. The vertical segment of the facial nerve has been exposed in our patient. It has been suggested that there are two types of keratosis obturans: inflammatory and silent. The silent type has rarely been reported; although, this case report may be categorized into the silent type of keratosis obturans. The inflammatory type occurs secondary to an acute problem, such as viral infection, causing inflammation of the ear canal which temporarily alters the epithelial migration. This is cured by removal. Whereas, the silent type carries on and on and is suggested to be caused by the abnormal separation of the keratin that persists even after the first removal, needing subsequent removals. There are reports of complications such as labyrinthine fistula, tegmen dehiscence, facial nerve palsy, and dehiscence of the temporomandibular joint and jugular bulb. Keratosis obturans may be benign but it is silently can result in extensive bony erosions. Hence, high clinical suspicion and prompt management are important as the treatment delay may result in serious complications. Shire JR, Donegan JO. 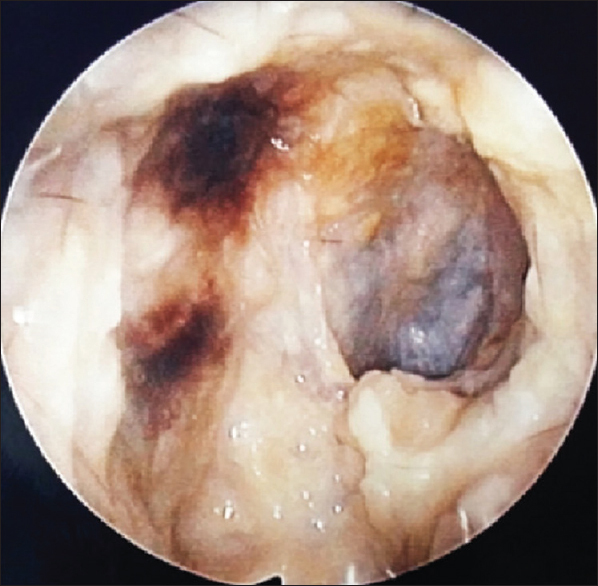 Cholesteatoma of the external auditory canal and keratosis obturans. Am J Otol 1986;7:361-4. Piepergerdes MC, Kramer BM, Behnke EE. Keratosis obturans and external auditory canal cholesteatoma. Laryngoscope 1980;90:383-91. Black JI, Chaytor RG. Wax keratosis in children's ears. Br Med J 1958;2:673-5. Chong AW, Raman R. Keratosis obturans: A disease of the tropics? Indian J Otolaryngol Head Neck Surg 2017;69:291-5. Hawke M, Shanker L. Automastoidectomy caused by keratosis obturans: A case report. J Otolaryngol 1986;15:348-50. Tristram HJ. Keratosis obturans and primary auditory canal cholesteatoma. In: Scott-Brown's Otorhinolaryngology, Head and Neck Surgery. 7th ed. London, UK: Hodder Arnold: 2008. p. 3342-4. Saunders NC, Malhotra R, Biggs N, Fagan PA. Complications of keratosis obturans. J Laryngol Otol 2006;120:740-4.